These days, it is very important to keep our trash as little as possible. In these times where countries are shipping trash to other nations because they have nowhere else to put it, it’s become very important to be able to go as zero waste as possible. If we can’t, we should at least have some sort of waste management plan. These things can (literally) last forever, so we should know what to do with it. One example of doing this is the making and use of ecobricks. As defined in the Ecobricks website: “An Ecobrick is a reusable building block created by packing clean and dry used plastic into a plastic bottle to a set density. Ecobricks enable us to take personal responsibility for our plastic.” The bottles are used to build various things that range from furniture, to designing gardens, parks and other structures. It all seems easy to do at first. If you take it at face value, it’s about putting your plastic waste into a plastic bottle. Simple, right? Not really. Turns out when I first started to try it that I was doing it wrong. I wasn’t putting as much plastic in the bottle. I wasn’t packing it in as much as I should. I ended up with several bottles that weren’t packed properly. One thing I did right was to make sure that the plastic I put in was clean. The wrong part? Not shredding it for packing. Some people don’t either, but I found that shredding it would make it easier to everything into the bottle. The fact that the bottles needed to have a set density meant that it should be packed tight and shredding it would help. Another thing I did wrong? Not using a stick to pack the plastic in better. I also didn’t follow the advice to put similar colors together and all that. As much as I wanted to, it would have been too much of a hassle to store too much trash in my room just to set the colors. I usually just put my trash in the bottle when I needed to throw it away. After six months I ended up with three bottles of what could be ecobricks. I think that I could do better but I didn’t. I think I lost enthusiasm for it when I found out that there were no places nearby that accept ecobricks. I ended up just giving them to the trash collectors. Still, I think that making ecobricks is a good thing to do. I for one became more self-conscious about the trash that I throw away. I think I make more of an effort now to be as minimal as I can when it comes to trash, particularly plastic. I think that even if no one accepts ecobricks in our area, it helps to minimize the amount of trash if I put them all in the ecobricks because it packs them in so that it doesn’t take up as much space that it would if they weren’t in those plastic bottles. 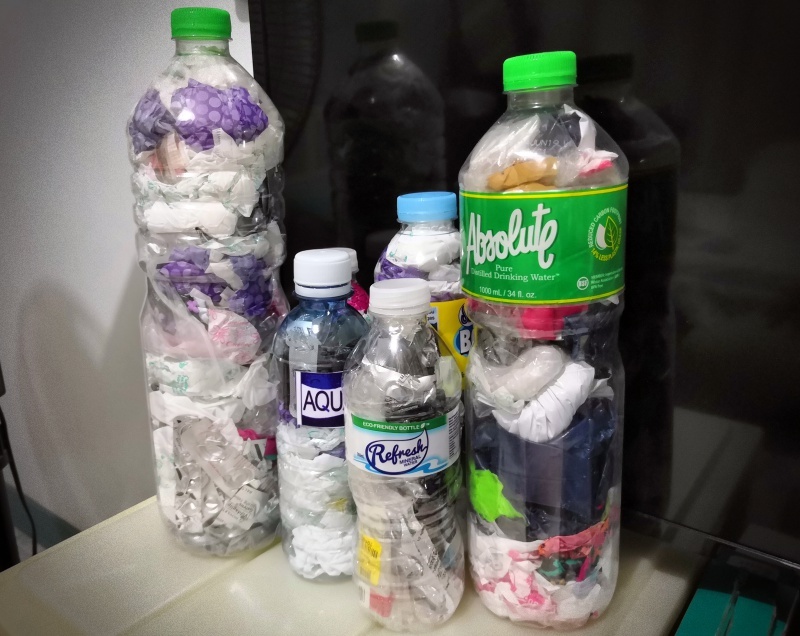 While I am happy that schools teach and encourage schools to make ecobricks, I was a little disappointed that some schools required their students to produce a certain amount of ecobricks to contribute to their school. I’ve heard of parents who had to produce more trash than they actually would have if they weren’t required to make ecobricks. They also did not teach them that they needed to clean the plastic before they are packed into the bricks. Not doing so could produce methane that could bloat the bottles and pop the caps open in the long run. I think the message in all this is that while it is good that we can manage our waste by making ecobricks, the better alternative would be to avoid producing that much trash as much as possible. If manufacturers could find a way to for the packing of their products to be biodegradable, that would be best. It starts with us as individuals but if we want to keep this up to save the planet the big companies (and the government) need to do their part to make sure that everyone is working together to minimize or eliminate plastic waste altogether. Have you checked your nearest Robinsons's supermarket? Some Robinson's supermarket accepts and they give you some eco-product in return. Hi! We don't have a Robinson's Supermarket near our area but I will check that out when I can! Thank you!! !